this is what our dining table looks like right now! there's a bit of a story behind a couple of the pieces, so bear with me. 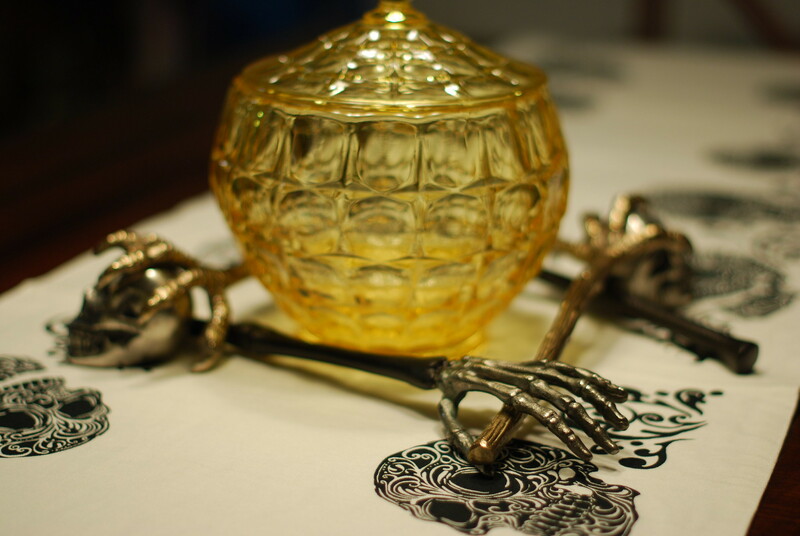 so, i've wanted these skeleton hand servers from pottery barn since last year, but they were sold out - so the instant i saw halloween decor show up on the website this year, i put them in the shopping cart. 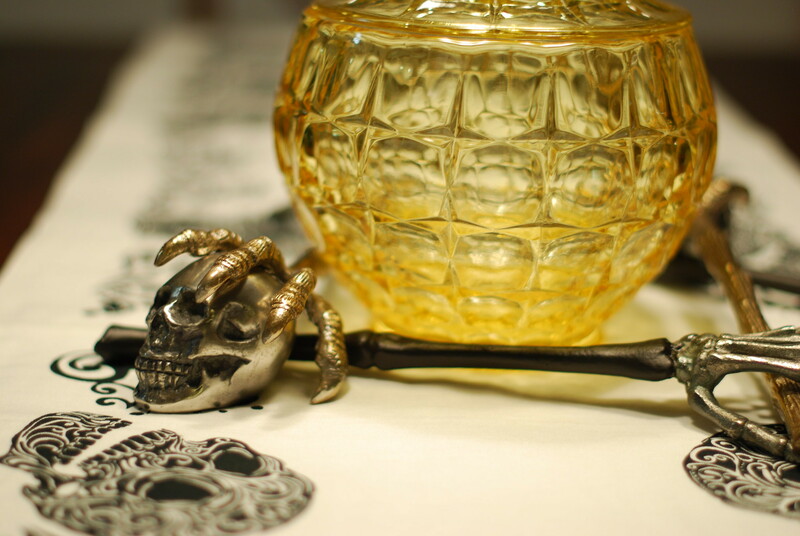 at the same time, we tacked on a few items we thought would be festive for the season, mainly the skull salt and pepper shakers (they're really heavy, we love them!) and the day of the dead table runner. 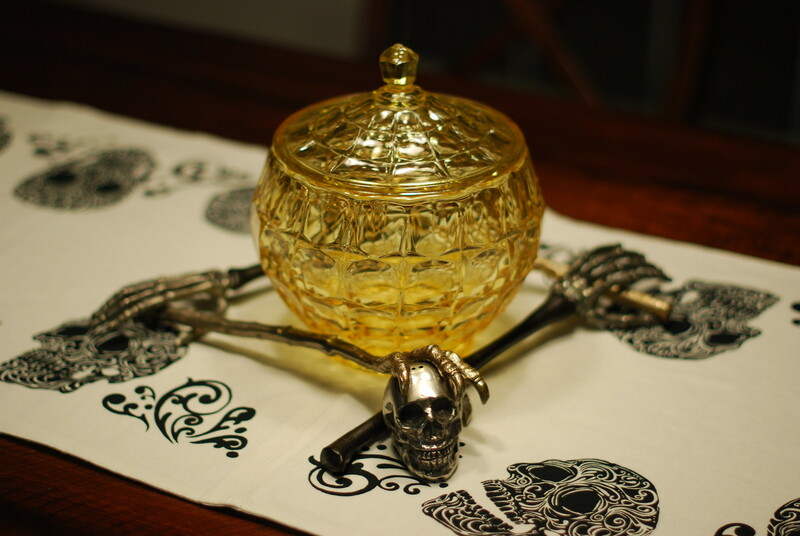 the yellow glass bowl was actually a vintage find by james's dad, who brought it (along with a matching platter and goblets! - yes, they are full on goblets) for us as a gift when they came to california in august. it's heavy and i absolutely adore the color - and it actually works really well with our "creepy" setting. now we just need to fill it with fake eyeballs or something else that's creepy crawly. the last bit piece to this puzzle is those chicken claw servers which we found at target of all places! the coffee table and a little restoration. purchased : sorting and ironing system.